Horror comedy is a genre that has come into prominence in Hindi cinema in the recent times. 'Great Grand Masti' and 'Golmaal Again' are two films that had a mix of horror and comedy in them. While the former tanked at the box-office, the latter turned out to be a huge success. Faraz Haider, who had earlier directed 'War Chhod Naa Yaar', remakes the Tamil hit 'Pisaasu' as 'Nanu Ki Jaanu'. The promotional material indicated that the film would have a balanced mix of horror and comedy. 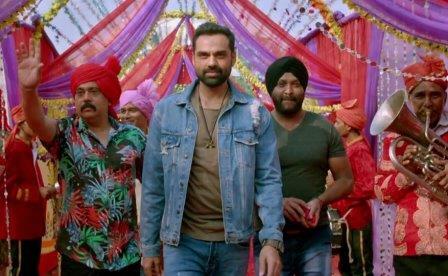 Nanu (Abhay Deol) leads a gang of small time criminals who rent apartments and then, force the owner to sell their property to them at a throwaway price. One day, Nanu sees a young woman named Siddhi (Patralekhaa) lying on the road after being severely injured by an accident. Though several people have gathered around her, nobody is willing to take her to the hospital. Nanu picks her up and takes her to a hospital. She is proclaimed dead soon after she reaches the hospital. Nanu gets extremely disturbed by her death and realises he is not being able to be the ruthless criminal he was. Suddenly, he starts experiencing some supernatural activities in the flat he is living in. He is convinced about the fact it is Siddhi's spirit that is behind all this. He approaches Siddhi's aggrieved father (Rajesh Sharma) but he refuses to believe him. I have not seen the Tamil original, so I cannot really comment as to how much of the original screenplay (Mysskin) has been borrowed from it but the adapted screenplay, written by Manu Rishi, is juvenile to the core. The dialogues fall flat and despite the idea leaving enough scope to generate laughter, emotions and drama, it delivers none of that. The humour is forced and barely leaves an impact and the subplot involving Siddhi and her father has been put to evoke emotions but it does not quite succeed at doing that. The horror element, too, does not work. There are some good moments between Nanu and his mother, played by Himani Shivpuri. The accident episode involving the mother has been handled quite well. Abhay Deol is a good actor and he tries his best to infuse some life in the poorly etched out character he has been given. Also, he does not come across as the most appropriate choice for this character. Patralekhaa is hardly there in the film. She does leave a mark in the climax sequence but her diction needs a lot of work. Manu Rishi disappoints as a writer but delivers a very good performance as an actor. Seasoned actors like Himani Shivpuri, Rajesh Sharma and Brijendra Kala do a fine job as always. 'Nanu Ki Jaanu' is a poor show all the way. The only thing that saves the film from becoming a complete mess are the performances. It is sad to see so much talent getting wasted in an insipid film.